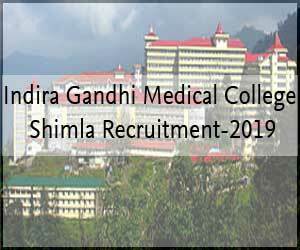 New Delhi: The Indira Gandhi Medical College (IGMC) Shimla has recently released 81 vacancies for the post of Senior Resident on Contractual basis. The selection will be based on Walk-in-interview. The Applications are invited from all the candidates fulfilling the eligibility criteria for selection of Senior Residents in various clinical and non-clinical departments/specialties of Indira Gandhi Medical College, Shimla on tenure basis for a period of three years/Six months (as the case may be) through the walk-in interview. Last date of receipt of application/hard copy on prescribed format (available at website alongwith photocopies of certificates/ testimonials etc: 22.03.2019 upto 10.30 AM. in the office of Principal, IGMC (Diary & Despatch Section) IGMC, Shimla, failing which the candidates will not be allowed to appear in the interview. Age: As per under Govt. rules. Pay Scale: As per under Govt. rules. Applications for the posts of Senior Residents in various departments of Indira Gandhi Medical College, Shimla, are invited from the desirous candidates on the prescribed application form as per Appendix “A” for a period of three years/six months on tenure basis (as the case may be) through Walk-in-Interview who fulfils the requisite qualifications and other terms & conditions laid-down hereunder. The specialty-wise vacancy is detailed in “Appendix-B’. The last date by which the application complete in all respects should reach in the office of Principal, Indira Gandhi Medical College,Shimla is on or before 22.03.2019 unto 10.30 AM. i) The vacancy/seat(s) is/are tentative, however, Principal, IGMC, reserves the right to either increase or decrease the post(s). Further, the selection will be subject to the availability of vacancy. ii) One seat of Sr.Resident advertised in Nuclear Medicine is subject to acceptance of resignation in respect of Dr.SuniI Kumar by the competent authority.